The Sigma F25 Tapered Face Brush has always been my favorite Sigma brush style, and I have accumulated nearly a dozen different variations over the years. The luxurious Copper Extravaganza version featured here, however, simply happens to be the the best of the F25s in my experience. Not only are the copper ferrules very unique (rose gold color), the bristles are quite soft and layered well — especially for the affordable price of $33 USD. The slightly pointed tip and rounded flat sides make this the ideal large powder brush, whether you want to apply powder foundation around the eyes and nose or bronzer into the hollows of the cheeks. 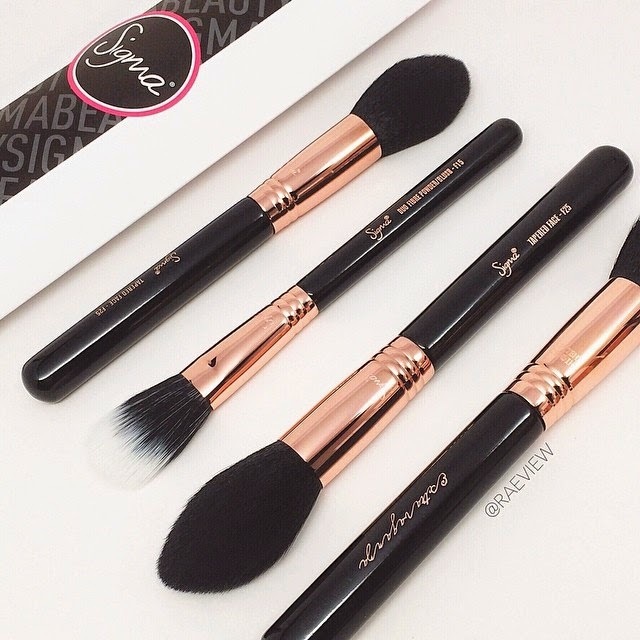 I love that this brush style provides control and gives exact placement of product. Check out more details and the giveaway after the jump! Now, if you have the room in your budget, I always recommend splurging for the best. There is a MAC version of this brush [the 138], but I do not believe in shelling out $53 USD for a mediocre brush when Hakuhodo makes the most wonderful option. Unfortunately, my Holy Grail brush, Hakuhodo's S103 ($93 USD) is sold out more often than it is in stock. That is why I recommend the budget-friendly F25 for use while waiting for the S103 to become available for sale again. Get your F25 here! Thanks for this giveaway! I've been lusting after this copper color F25 for a while, and it's always sold out. Finger crossed! TRAVEL: My Epic Asia Exclusives Beauty HAUL! TRAVEL: My Beauty Essentials + How to Pack Them!